The Discraft Crank is a new max distance driver that will start to see more exposure this season now that the weather is getting warmer. It is a speed 13 disc that’s claiming to be easier to throw due to a touch less stability than the Nuke, and a smaller sized rim which allows more control. I had my first full week of use in January on a trip to Florida. While I did pick up a Special Edition Heisenberg blue Glow Z-Crank (with the Breaking Bad style stamp), I did not bring it with me for fear of losing it in a gator infested swamp… so I will only have direct feedback on the ESP Crank, which was 172 grams. As a reference point, I am a RHBH golfer, and throw about 475 feet on average when using my putters. And when I say 475 feet, what I mean is about 300. And when I say putter, I mean my Wraith. But getting back on track here- I brought the Crank along as a fill-in for my beat Star Wraith because I was afraid of losing that to gators as well (or was it crocodiles?). The first few rounds I threw drives assuming that this disc would start out a little stable at first, but be relatively easy to get some S-curves out of it. That wasn’t the case. For me, this disc turned right pretty consistently. If I tried to throw it flat and hard, it would turn pretty aggressively. Because of this fact, I had about 5-6 throws to start off that were no good. The first correction I tried to make was to give it hyzer and snap the crap out of it- this didn’t really work for me either. Partly because I don’t throw a good hyzer-flip, and partly because the disc isn’t flippy. The turn of the Crank is gradual out of the box. I didn’t experience any sort of “pop up and glide,” and didn’t even really get a whole lot of S curve out of it either. The Crank’s profile isn’t flat, but the dome is nice. That being said, once I stopped throwing like a maniac I delivered some controlled drives. Using a smooth delivery, where I focus more on keeping my eyes on the target (and thus taking away a lot of power and shoulder turn), I started throwing some great shots with this disc. If you’re familiar with North Port Charlotte Regional Disc Golf Park, there are numerous narrow but straight fairways with low ceilings and thick underbrush on either side. They are 300+ feet on many holes and if you want a chance to birdie them, you need to throw a distance driver. However, all my other distance drivers don’t have a flight path that would get me near the baskets. If I threw one of my newer Star Wraiths, the lateral coverage of the S curve would hit either side of the fairway. If I tried to mash my Star Destroyer I could get it 280 feet down the low ceiling fairway but then it would fade hard to the left and give me a desperation putt for birdie (not to mention the fact that many of the holes had a left to right bias). The Crank flew in that narrow anny flight path and covered a lot of distance. It had a very slight fade at the end, but with the low ceiling controlled shots there was virtually no skip- so I would never be more than a foot or two into the underbrush but still pin high. The striking thing for me was the instant success I had when I found it’s sweet spot. Throwing a couple good shots with a new disc is fun, but I threw this disc on at least 7 holes and it always did the same thing. It always flew fast, gave a slow and narrow left to right turn, and finished straight. Here’s a view of the Crank’s rim depth/height- plenty of room for solid grip. 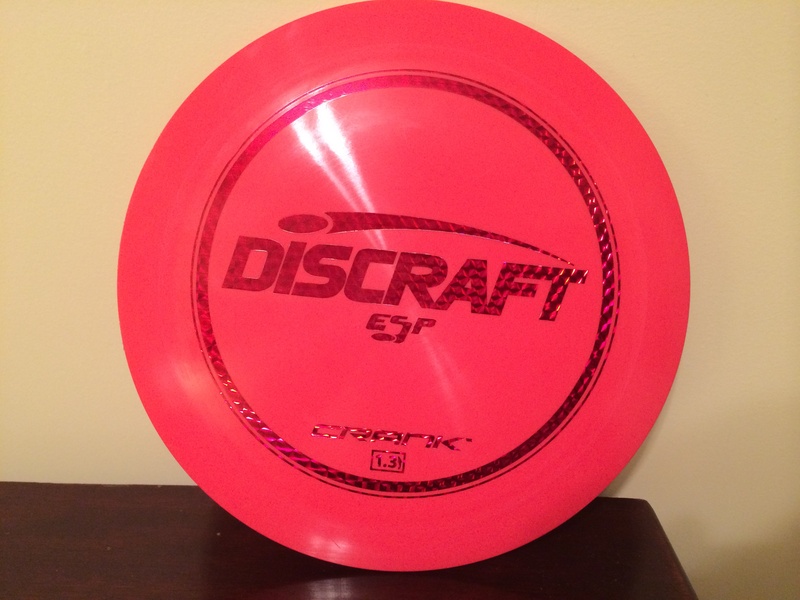 One of the blurbs you read on Discraft’s website is that the Crank has a narrow rim that allows more control. I would agree that it is a smaller rim than the Nuke, however I still found it to be a substantial sized rim. I actually liked how this disc is still a speed 13, has an under-stable flight path- but the HEIGHT of the rim is still thick. 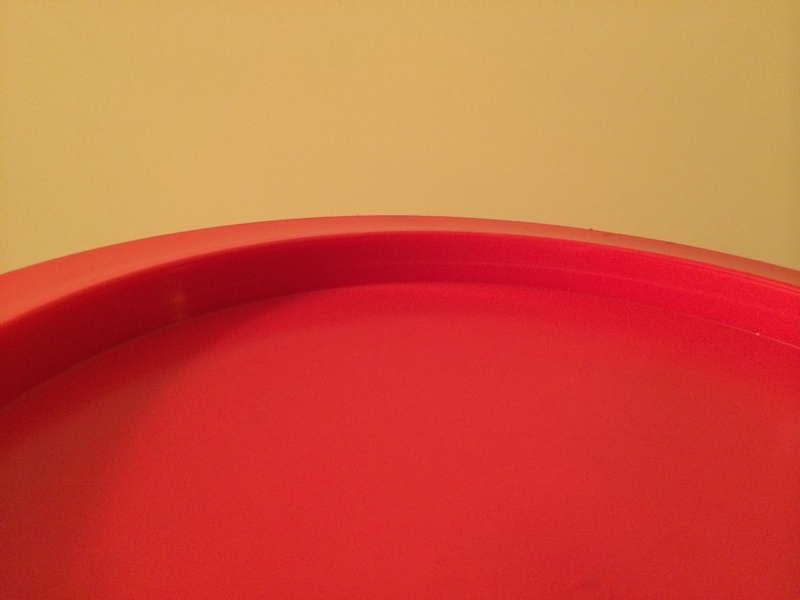 With a disc like the Nuke SS, especially if you get a flatter version, the rim is just so shallow. It may be thick, but the area where the pads of your fingers rest in a power grip is just tiny. The Crank does not suffer from this in any way- so you get a consistent and confident grip. I should add, that once I did learn how the disc flew, I did have a pretty nice max distance shot using a hyzer-flip flight path. On a more or less wide open hole I tried giving it more power with a hyzer release and the disc behaved the same as before- it just flew on my new angle of release. So where a disc would normally “flip” or “pop up” became a gradual change of angle- flying practically dead straight the whole way- with a virtual straight finish. The whole flight was about 340 feet (which is where I max out for distance unless I lose control or get lucky). 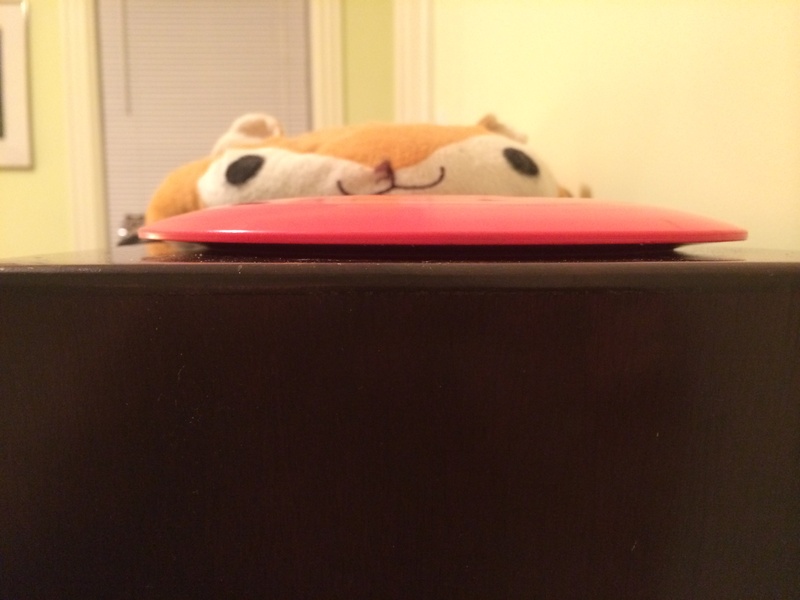 In general, the disc feels nice. It’s the first time I have thrown a new, out-of-the-box, under-stable distance driver and enjoyed it. I wanted so badly to like the Archon, Katana, Nuke SS, UnLace and others, but never felt like the disc fit me well. The Crank is under-stable enough where I won’t ask it to do too much, but it’s turn is gradual and super useful. I look forward especially to trying it out on wide open holes where I just want my disc to “not go left” at the end. While in Florida, I didn’t get many chances to throw wide open holes- so my perspective of it’s flight path is a touch limited. It IS going to remain in my bag for the foreseeable future. I think the added distance on controlled shots is where this disc really shines. On a straight wooded hole where you might throw a TL, you can probably throw a Crank (with a similar amount of power) and get a longer result. The only variable I see at this point is how the ESP will hold up over time. If it becomes too flippy after a short time, I’ll have to try out the Z version. I just don’t like having to break in a new Z disc- so I may be more apt to just pick up another ESP. 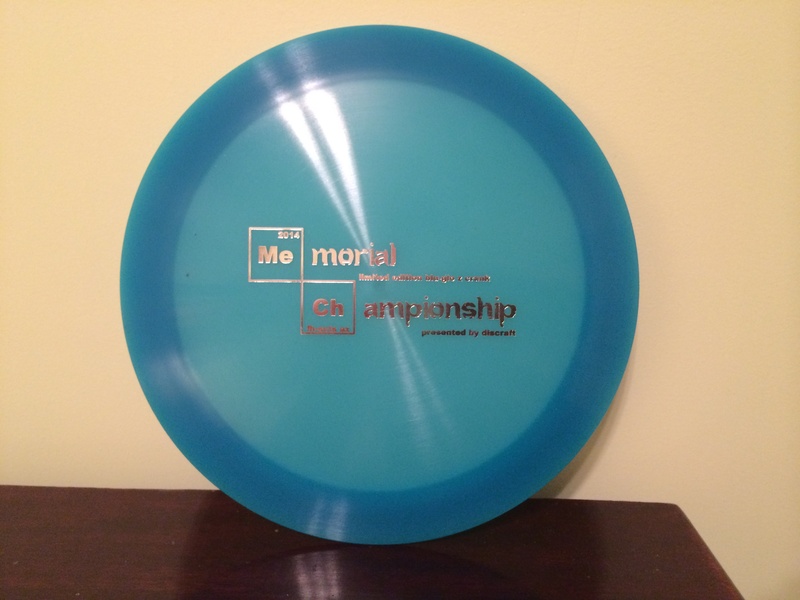 This entry was posted in Equipment and Gear and tagged crank, disc, discraft, esp, golf, new, review. Bookmark the permalink.